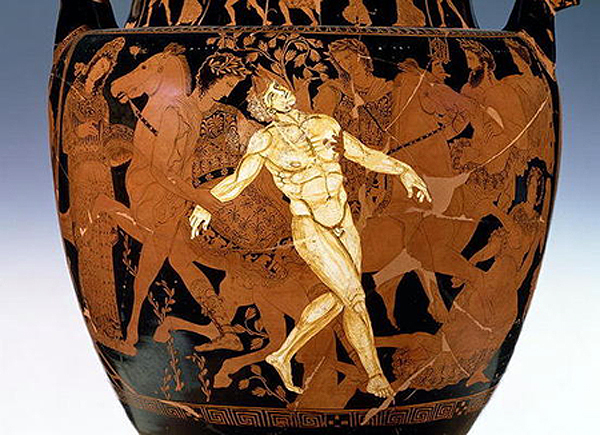 This 5th-century BCE Greek vase depicts the death of Talos at the hands of Medea and the Argonauts. The artist is known only as the Talos Painter. Talos was a giant bronze man, the Cretan sun god and general guardian of the island. There are many conflicting stories about his genesis, purpose and death, but his role as protector of Crete is a common thread. Zeus and Hephaestus (the god of the forge) are variously named as his creator. Talos circled the entire island 3 times each day (to account for this, some ancient depictions show him with wings) and lobbed boulders at unauthorized ships that approached the island. Any invader who reached the shore would die a hideous death in his hot-metal embrace. Talos had one vulnerability – a plug on his ankle, which contained the molten-metal life-blood coursing through a single artery. When Jason and his Argonauts attempted to land on Crete to resupply after their Golden Fleece adventure, they were held off by a barrage of rock-missiles. Fortunately, for the Argonauts, Jason’s wife, the sorceress Medea, was also on board. She cast a spell on Talos, which caused him to remove the plug from his ankle and “bleed” to death. Some scholars suggest the story represents the cultural, political and technological transition from the Bronze Age and the power of Minoan Crete, which collapsed around 1100 BCE, to the rise of Proto-Greek groups, which invaded Greece in waves across the millennium prior to the fall of Minoan Crete. This entry was posted in Greece, islands, Myths, Stories and tagged Crete, minoan, talos by yalla2013. Bookmark the permalink.